About a month ago I began using a Weider PowerSwitch Adjustable Dumbbell Set with my nine year old son, which includes two 12.5 lb dumbbells. Each dumbbell may be adjusted to weights between 5 and 12.5 lbs. in 2.5 lb increments. Here are our impressions of the experience with the Weider dumbbells. My son and I wrote this review together (the dumbbell set belongs to him). At home we have a full set of very nice Body Solid rubber coated dumbbells. We started carrying the Weider adjustable ones, and I did not expect to use them much myself, but here’s what happened: My nine year old son spotted a set of these at our office and took an interest. I told him that if he does really well on his next math test that he could have them. This was kind of an expensive incentive (they run around $120), but we no longer had the box for these and he’s looking to build strength for the competitive swimming he just go into. All went very well for him and a week later we brought these home. 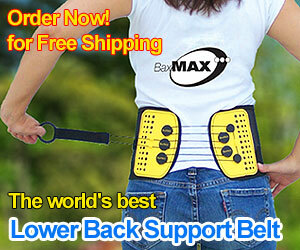 I began using these every other night with him and found these to be a great alternative to a set of dumbbells. 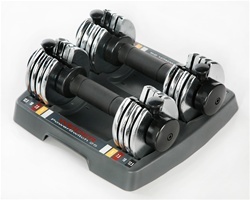 This set of two adjustable dumbbells takes the place of ten dumbbells. In our already cluttered home, the space savings was very nice. Here’s how they work: On each side of the Weider dumbbells, there is a sliding switch that is moved by pulling up on a spring-loaded pin. As you move the pin from side to side the dumbbell engages the weight plates. The pins are easy to align with the color-coding on the storage tray. When you pick up the dumbbell, the weight plates you don’t need stay in the tray. I was concerned when I first saw these that the plates would flop around on the dumbbell while working out. This was certainly not the case, the plates are held firmly on the grip with little movement. The grip is nicely padded with high density rubber, so an extended workout is no problem. Strangely, the padding is on the 12.5 weights, but not on the adjustable 25 lb dumbbell. Perhaps the 25 lb is for more serious workouts, where the padding may not be desirable. Overall quality is excellent. Like most Weider products, these should last for years and years. My only concern is the storage tray made from plastic. Not a big deal, and we had no problems with it, but a few years from now I can imagine that it may crack. These are very convenient and easy to use. My son has no trouble setting the weights for his workouts. Because they are compact enough to keep in his room, he uses them more than the big set in our basement. Bottom Line: I highly recommend the Weider Adjustable Weights if space is a concern. Even if you have the room, the convenience is nice. High quality & easy to use. I believe this is a great excerise to become fit for nearly no expenses. There’s a lot of trainers advising people to get all kind of expensive equiment. Great topic.